The information in this article applies to PwrSmart Service. PwrSmart Service is a risk-free PC power management solution that instantly saves energy and reduces carbon emissions by powering down PCs when they are not in use. Why should you bother? Because a typical organization with 1,000 PCs and no centralized PC power management solution spends up to $70,000 and wastes 779,000 kWh per year for powered-on PCs that are not being used. Remote Wake is a new feature of PwrSmart™ Service that gives users the ability to securely wake their PwrSmart Service-managed PCs from any browser at any time. This means IT administrators no longer need to keep an organization’s PCs powered on 24 x 7 - wasting energy - just in case someone wants after-hours access. Instead, they can confidently use PwrSmart Service to put computers into a low power state when they’re not in use, knowing that users will have a way to remotely power them on again if the need arises. What are some typical Remote Wake scenarios? Today’s workforce is mobile, dispersed and running on a flexible schedule. Workers occasionally need to use their work PC after hours and on weekends. Let’s say a company uses PwrSmart Service to put corporate PCs into hibernate mode starting at 6:30 PM every evening and all weekend. If the HR manager wants to log in over the weekend to work on a benefits presentation, she would log into Remote Wake, wake her computer, then use her usual method (for example, VPN with remote desktop) to gain access to the presentation on her office PC. IT administrators can use Remote Wake to securely wake any managed PC, giving them the ability to do unscheduled, spur-of-the-moment maintenance tasks on some or all managed PCs. Combined with PwrSmart’s scheduled Stay Awake™ feature, Remote Wake gives administrators the ultimate flexibility for maintaining their systems, while still saving significant money and energy. What are Remote Wake’s requirements? · The computers to wake must be managed by PwrSmart Service. · The computers to wake must support wake on LAN, and they must be configured to use it. · Each network with wake-able computers must have at least one computer that is powered on to send the wakeup packet for that network. Servers can fulfill this role, and so can workstations. Servers running the PwrSmart client will only act as wake agents – power settings will never be enforced on them, even if a power scheme is inadvertently assigned to them. · Mac computers can only process a wake on LAN request when they are in sleep mode, not when they are fully powered off. · Mac computers can only process a wake on LAN request when they are physically connected to the network, not when they are connected wirelessly. What are the steps to configure Remote Wake? The PwrSmart administrator configures use access to Remote Wake within the PwrSmart Service administrative console. First, log into PwrSmart Service and create a new user on the Administration|User Management page. Next, use the Manage Roles link on the new user to assign the new user the Remote Wake role. 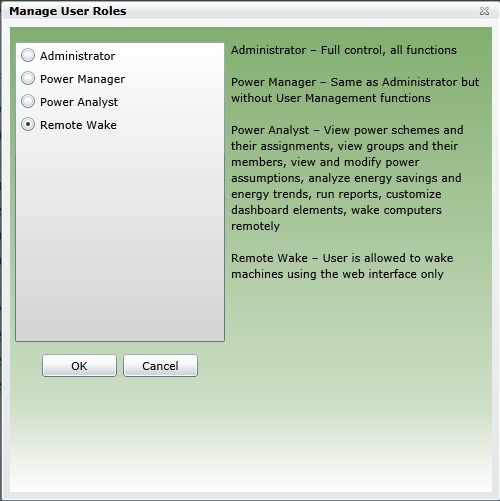 The Remote Wake role allows the user to use Remote Wake, but it does not allow them to log into the PwrSmart Service console. Next use the Configure Wake link on the new user to choose the computer(s) the new user is allowed to wake. Typically users only need to wake their own PC. Below are some screenshots to illustrate the configuration process.